It is difficult to hold a hard rock / heavy metal festival even when you sell out the event but much harder to do so when ticket sales compromise the festival’s financial viability. 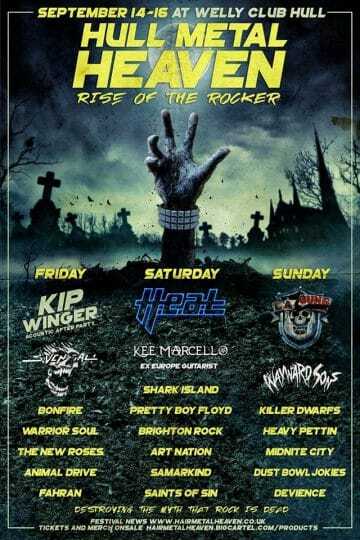 The Hull Metal Heaven Festival in Hull, UK is at that fork in the road with poor ticket sales in advance of its event that will take place from September 14 to 16, 2018. Faced with some difficult decisions, the Hull Metal Heaven Festival has decided to forge ahead but will be trimming part of its festival roster by eliminating a few bands from the festival. We appreciate nothing more than the support of our fans so we want to be open and transparent with you all. We have always said we are a fan led festival – By the fans for the fans. So people deserve the truth. We’ve been praying that our ticket sales pick up but ultimately and whether it be the style of music or the area the show is in, the sales have been really poor. As a consequence we have had to trim the line up to keep it moving forward. We hold no ill will towards the bands but WE have to do what is right for the festival. So how do we move forward? The team have sat and discussed pulling the plug but it would break our hearts to do that, but at the end of the day it might be the only option. The other option is to try and make it work but lose a few more bands without upsetting the balance and raise some cash with a crowd funding page where we sell our merch and try to get some cash through the doors. Most of the bands are booked and paid for. We WANT it to happen. It will be our last festival. We cannot sustain it anymore so if we are going to go out then we should at least go out with a bang. We appreciate this may upset some fans, but rest assured we are trying to make this work. Thank you for your continued support – Let’s unite and have one hell of a party next month. The Hull Metal Heaven Festival was previously known as the Hair Metal Heaven Festival last year and its organizer ran into financial and logistics problem, which prompted its VIP acoustic performer Michael Monroe not to perform seemingly at the last minute and resulted in financial losses for its main organizer. Tickets for the Hull Metal Heaven Festival at the Welly Club in Hull, UK from September 14 to 16, 2018 can be purchased at the festival’s Big Cartel site.